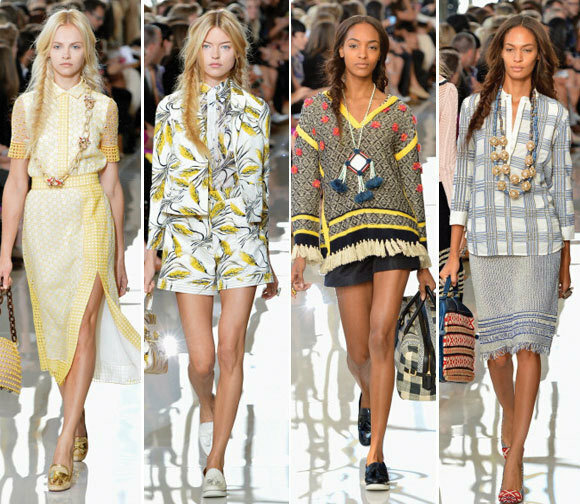 “America the Beautiful,” is none other than the dynamic concept Tory Burch has vividly portrayed in her 2013 Spring/Summer RTW collection. Showcased in New York’s Mercedes Benz Fashion Week, viewers are captivated by the essence of a preppy ladies’ multiple destinations — much of which is reflective of the designers’ style and staggering voyages throughout the country, where her label competes to be globally recognized as an American luxury lifestyle brand. She takes on a colorful serene journey through the prairie with relaxed wheat printed dresses, loose wheat inspired fishtail tresses to a cultural escapade in the Navajo lands, as beaded sandals and Moroccan slippers catch the eye — compliments of shoe designer and stylist Tabitha Simmons. Not to mention a personal touch of hand done tie-dye designs and fabrics by Guinea female artisans. The collection embodies the soul of a free willed woman enthused with confidence. She indulges in exploration and appreciates the simple things in life. Burch expressed during a preview at her studio that the woman is “classic in spirit, but a bit of a traveler. She has a “magpie sensibility.” She emphasizes that the wearer gives her wardrobe a boost with items she has collected from her passages. Carry on bags make for a perfect companion for the traveling woman, which come as no surprise that they have been implemented as part of the season’s offerings. Accompanied by a range of statement necklaces from Ghana, the accessories exhibit a presence all of there own. “This is a great way to tap into the spirit of spring — everything feels like it was picked up in a bazaar or market…. We detailed bags, shoes and jewelry with mirror-work, cowrie shells, embroidery and straw”, Burch notes on her blog. Models took to the runway sporting a divine color palette of soft yellow, blush, coral, red, and cobalt blue mixed in with earthy neutral tones and white. Exquisite layering, a Burch signature, is seen heavily throughout the collection with notable looks including a shorts and blazer ensemble as seen on Chinese model Fei Fei Sun. A chunky beaded necklace adds to the finishing touch. Minimal makeup poses to be a key contributor. In fact, less is truly more, bringing the focus to the garments and accessories with their enriched and attractive detail. More so, respect to the attitude of the woman and potential wearer is conveyed. She is not overdone, yet still exemplifies an irresistible charm and mystery about her. The consistency is seemingly the designers’ specialty, for last year’s spring 12’ collection portrayed a similar magpie theme with recognizable accents of color, print, beading, and raffia fringe, but in that case was intertwined with a Coco Chanel-esque twenties inspired theme. Nevertheless, she continues to bring a recognizable aesthetic that sets her a part from the opposition. Less than 10 years old, Tory Burch continuously fashions its consumer through boutiques across the U.S., Europe, Middle East, Asia, toryburch.com, and over 800 select department and specialty stores worldwide. As for what’s in store for future collections, curiosity and anticipation prevail.